Just removed carpet and found this nice hardwood. Post subject: Just removed carpet and found this nice hardwood. Just have a couple questions. There are some spots with paint spilled. What is the best way to get that up without sanding? I'm not ready to sand and totally refinish yet - I just want to make it look nice. I tried a 3M green scrub sponge pad with water (you can kind of see the pad in the picture in the area I did). Paint comes up but is not efficient - takes too long and gums up quick. I'm am assuming it is a latex paint because of the gummy and gooey consistency that builds up on the pad. Is there a chemical that would break the paint down much quicker? Paint thinner? Also there is a darker stain in the middle of the room. Is there anyway to get rid of that, or at least try to without sanding? This will have an area rug over it. Like I said, I'd like to clean it as good as possible and make it shine without doing a complete sand/refinish job yet. 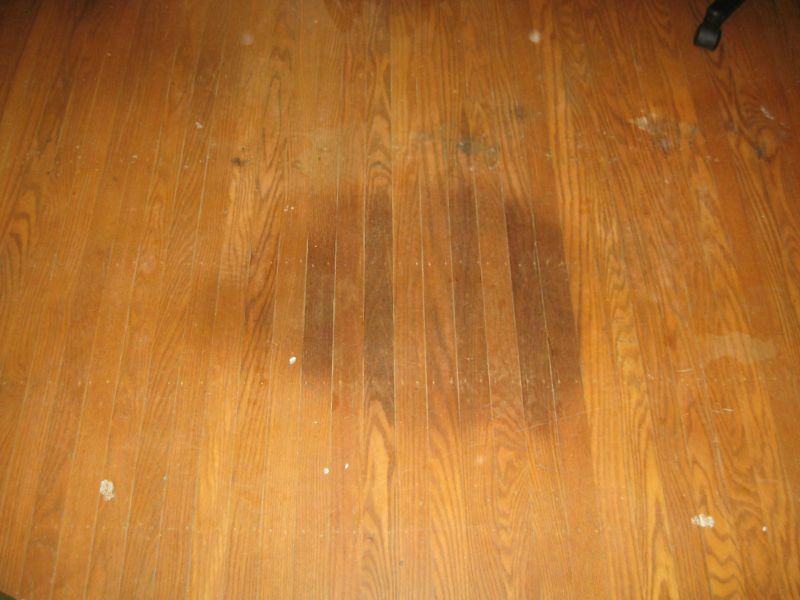 Post subject: Re: Just removed carpet and found this nice hardwood. I'd keep on doing what your doin. The bottom photo looks like a large pet stain. Probably need some repair anyways. Use less water, more elbow grease. I did a little more tonite - more elbow grease YES! It's really hard to get the paint out of the cracks - any advice for that? There's gotta be a chemical to help solidify the paint to help it come off. I was thinking mineral spirits, goof off, or paint thinner. When I took the paint off of my '67 VW Beetle I used "Heavy Duty Aircraft Paint Remover". That stuff was neat, and made the paint just bubble off and you could wipe it right off. 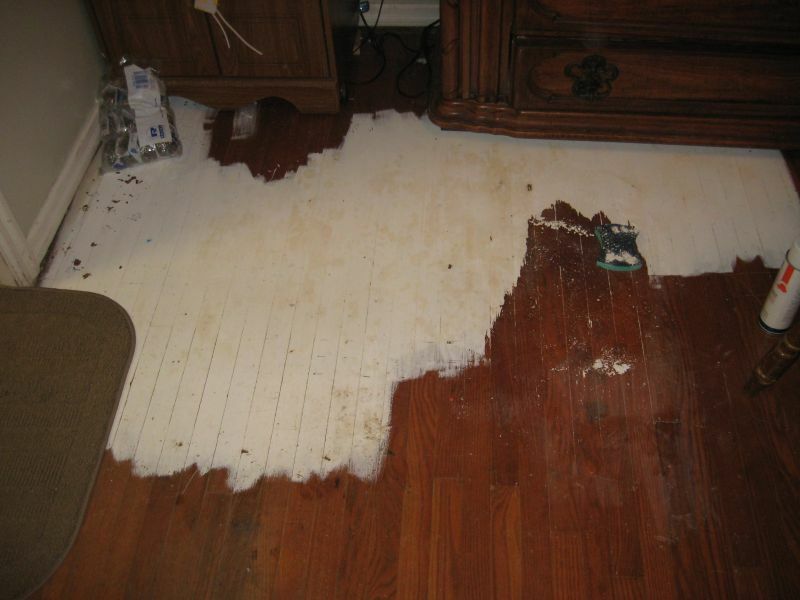 i wouldn't use that on the wood floor, but maybe there is something that does something similar. If I just rent a sander - I guess that would easily take it off, right? That's probably the route I would go at this point. I'm just not ready for dust everywhere. Absolutely do not use chemical strippers. Thanks for the replies. A couple days after my original post, I went out and got a sander from home depot. It was only $60 for the day and it sanded great. Took it right down to the bare wood. After cleaning it and tacking the floor, I brushed Minwax stain on it and it turned out great. You can still notice some of the old stains a little bit but not bad at all. I will post pics later.